A Holly Jolly Christmas Concert! Woodley’s Christmas concerts are the perfect way to kick-start your Christmas with carols, Christmas songs and the chance for a bit of a singalong! Join us for a fun-filled dose of festive merriment and get Christmas under way with a bang! 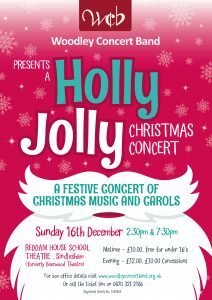 Please note: Our 2018 Christmas concerts will now be held at Reddam House Berkshire (formerly Bearwood College), not, as previously advertised, at the Bulmershe School.